The trial of Salvadoran military commanders for their roles in the massacre of children and others in El Mozote and neighboring communities is continuing to proceed. The trial, which is being overseen by judge Jorge Guzmán in the town of San Francisco Gotera has had some additional developments. For the first time, the office of El Salvador's attorney general has taken an active role in the trial. State prosecutors put on the stand additional victim witnesses to testify about the massacre. Their testimony adds to the list of people, primarily from outlying communities, who were witnesses to some part of the Salvadoran army's actions during the massacre. During the past several months, the government of El Salvador has received significant and ongoing criticism for its human rights practices in matters of public security as it wages war against the country's street gangs. 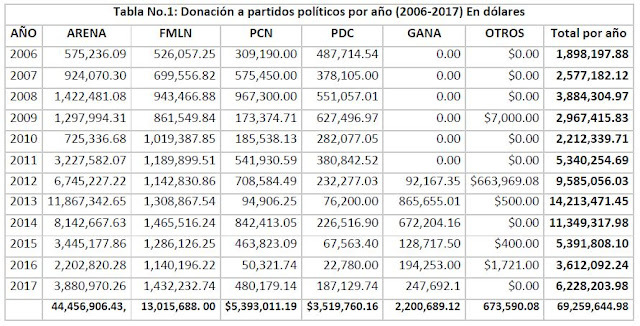 The Social Initiative for Democracy ("ISD" for its initials in Spanish) is a civic organization in El Salvador focusing on transparent government, electoral democracy and elimination of corruption. On Wednesday, February 14, ISD issued its first monitoring report for the upcoming March 4, 2018 elections. US president Donald Trump spent a considerable amount of time on Tuesday talking about the Central American gang MS-13. Trump uses the gang as the reason ICE needs additional resources and enforcement authority and as a reason to limit the entrance of asylum seekers including women and children from Central America. Donald Trump doesn't really know much about MS-13. But the investigators at InsightCrime and RevistaFactum do. So it's important to read their recent article Why Trump is Wrong to Blame Migration for MS13 Expansion, Violence at the InsightCrime website. Make no mistake about it. MS-13 gang members are dangerous. They kill and dismember and threaten innocent people who live in the neighborhoods they control. They do this in the US, but their violence is much more a plague on communities in El Salvador. Thousands of migrants are not MS-13 members, but are fleeing to avoid becoming their next victims.